With the critical reception it received, and the key nominations that it surprisingly won (Director, Actor, Adapted Screenplay), I’m pretty sure it got the second highest number of votes for Best Picture. I guess the only reason it did not actually win is because there wasn’t much eager campaigning, and the Academy wanted to reward a movie that made them feel good, which happens to be Chicago, albeit it is also very dark yet entertaining. Four serious movies and one dazzling musical? Maybe that did the deal. 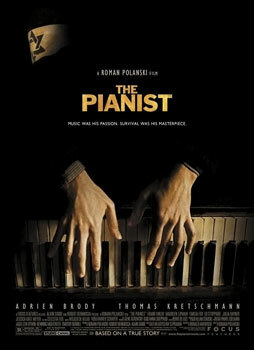 The film is about Wladyslaw Szpilman, a Jew pianist who does radio broadcasts of his performances. His regular gig gets interrupted when the war erupts in their country. As he and his family keep abreast of the situation of the war, he still performs on a restaurant, but as the prejudice towards the Jewish community rises, their lives are put into danger. As they are about to be sent to the concentration camp, a concerned soldier forces him to go away and hide. In his struggle to survive, he finds himself helped by different people that he unexpectedly found to be friends. The film does not hold anything bac in showing the realities of the war in the eyes of the main character. The deaths and the events are not stylized, but instead, it uses a very natural way of showing it. In that way, the violence, both emotional and physical, is not exploitative in any way. All of the scenes are shown with the attitude like “what you see is what you get”, and because of that, the film feels dramatically raw. That was achieved by the carefully handled direction by Roman Polanski. The screenplay flavours the scenes with more dimensions to each character. The character of Wladys is a very discreet one, and we only get to understand his emotions not really by his words but mostly through the effort of the actor, but it is also the direction that makes the characters rich in texture. The cinematography is very much helpful in creating the aura of rawness in the film, as the editing is also the one responsible for the visceral punch of the scenes. The music is sparsely used, but it effectively used, especially in key scenes where Wladys is playing the piano. The production is very impressive, with the beautifully designed costumes to the haunting production design and even to the masterful make-up that was applied to Adrien Brody, successfully and realistically putting the transformation in his face. The supporting actors are very good, but they all blur when you think of Adrien Brody’s towering performance. Surprisingly, his performance is very subtle and is almost too natural at the start of the film. But as the unrest intensifies, the gradual effect on the character is realistic, and the horror that he witnesses that he cannot put into outburst is greatly evident in his slow manipulation of his facial expression, his emphasis on the eyes as his vessel of connecting to the audience, his strong representation of his despair with his complete body language – it’s a haunting performance of superlative effect. Brody has not done many remarkable roles after this movie, but this film is the proof that he can actually deliver. Just get him some great material to work on. What we have here is a devastatingly powerful film that took me by surprise on how it was able to blend beauty that feels so natural and violence that does not feel exploitative in nature. The director is definitely in his best, the screenplay plays vital help, the lead actor brings one of cinema’s best male performances – it’s heart-wrenching cinema. Definitely a must see. This entry was posted in Best Picture 2002, Best Picture Project and tagged The Pianist by Juan Carlos Ojano. Bookmark the permalink.